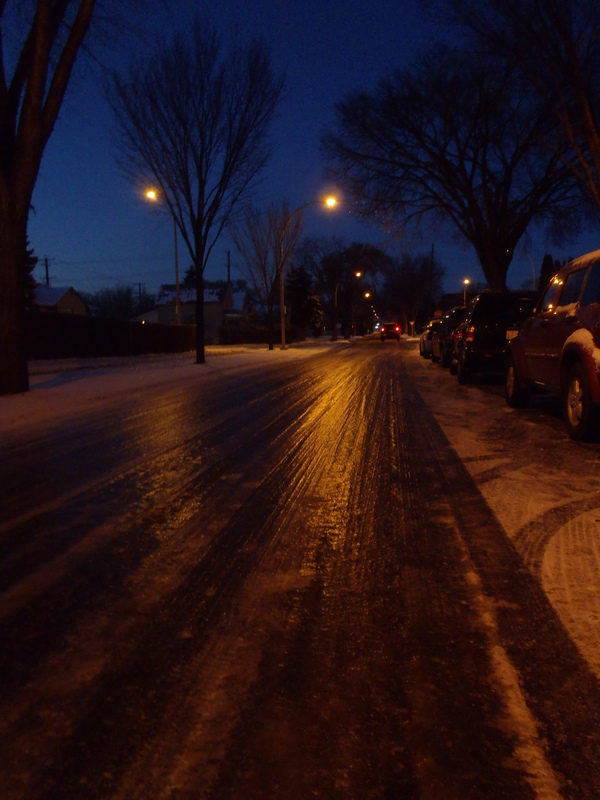 CON: Long stretches of pure ice. 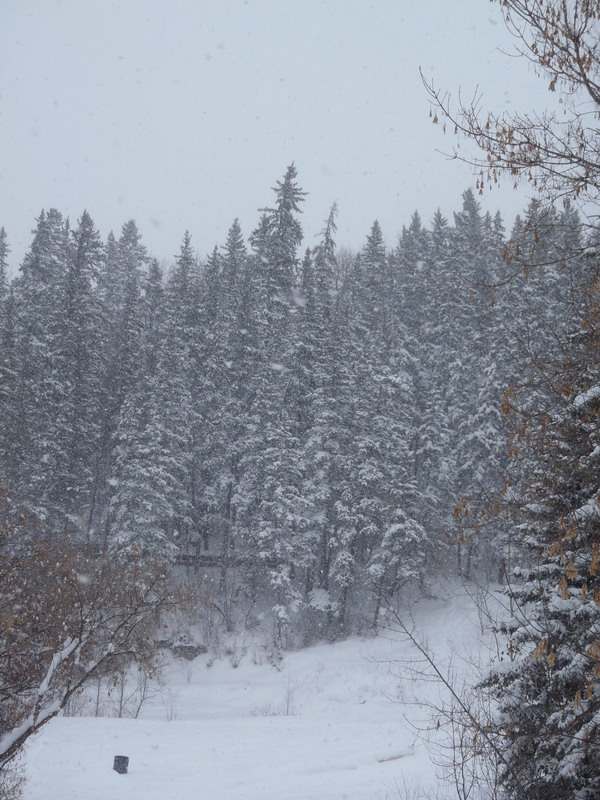 This is what the second day of spring looked like here in Edmonton. During the mild weather of late February and early March I was getting used to riding on asphalt again. 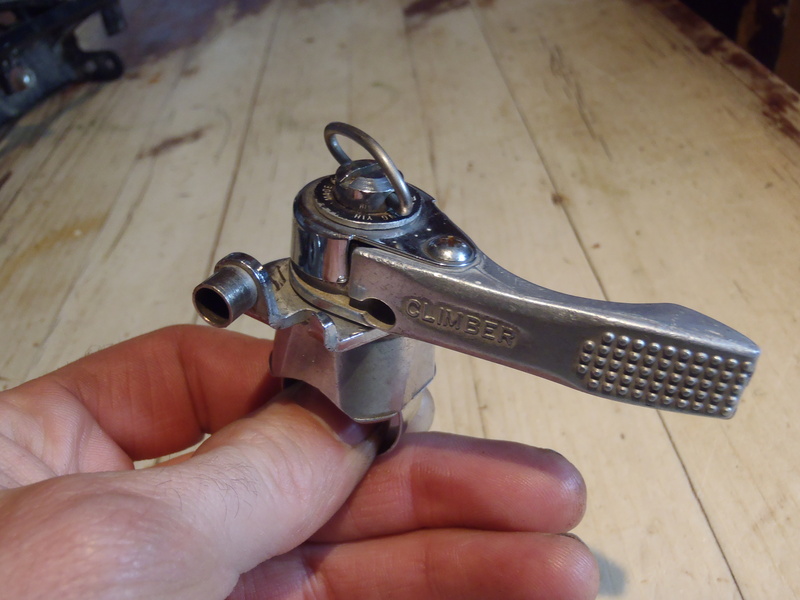 Dreams of zipping about on summer bikes were starting to overwhelm me. No worries about that happening soon. 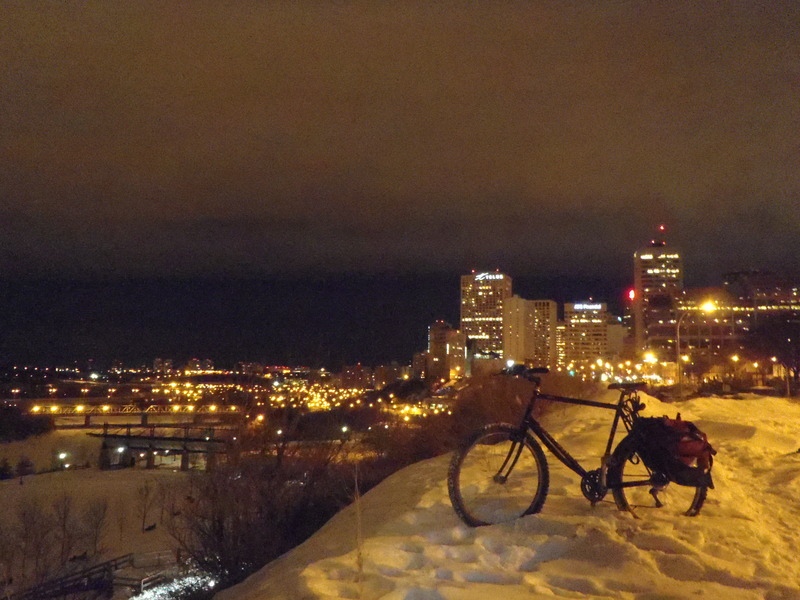 I am fully back in winter cycling mode. It was a pretty good spring snowstorm that settled in on my fair city on Thursday. 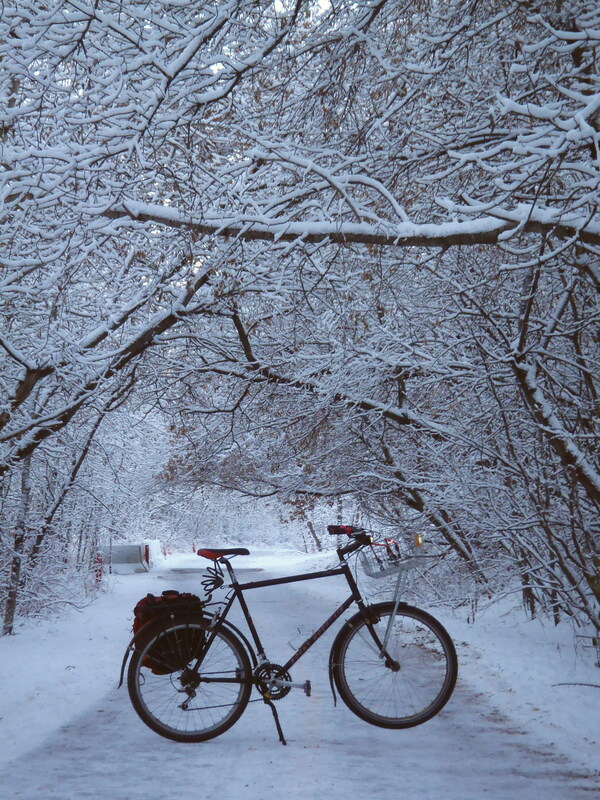 The morning ride to work was through an idyllic winter wonderland. 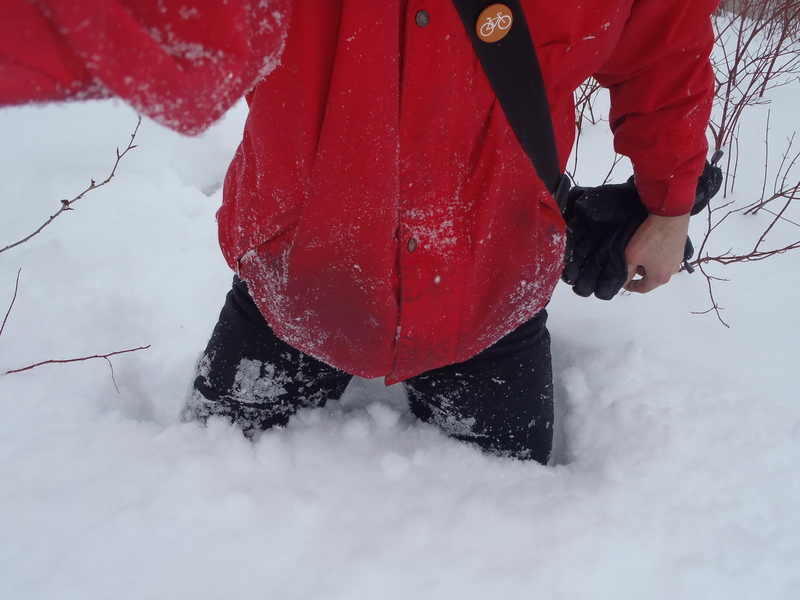 The snow was falling heavily but had only accumulated a couple of inches deep. 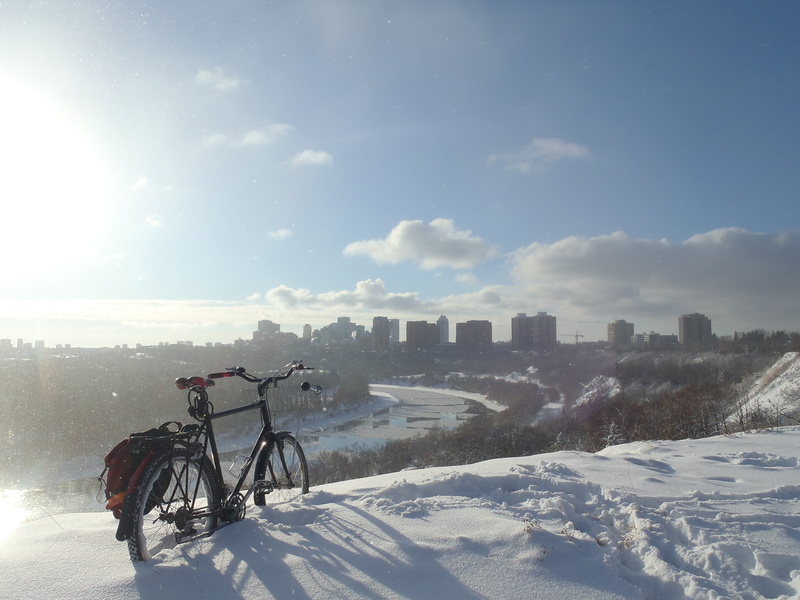 It was such a perfect winter morning (pardon me, spring morning) that I was tempted to call in sick at work and spend the day cycling. Instead, I dutifully toiled the day away on the huge backlog of work while frequently glancing out the window at the ever deepening snow. 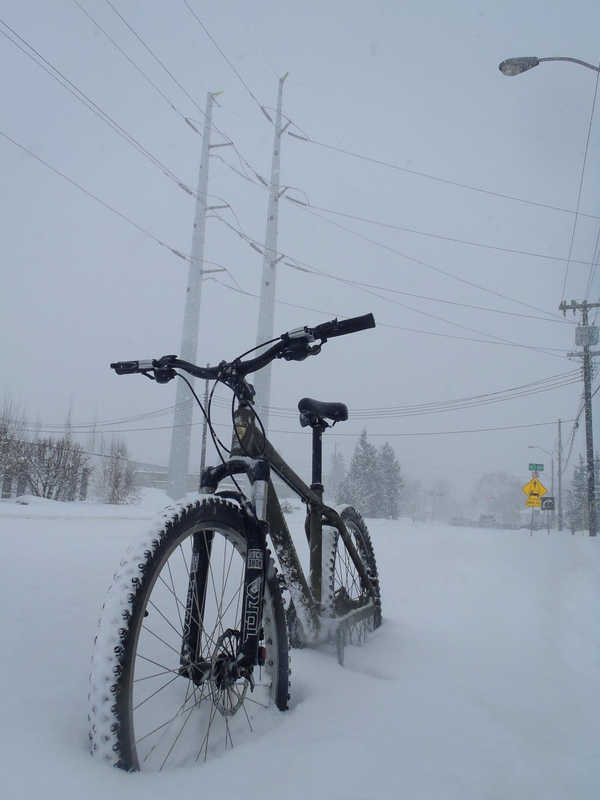 During my lunch break I went out for a quick ride around the industrial neighbourhood and had a lot of fun. The ride home promised to be interesting. The radio was reporting the closure of major roads and many accidents. There was a 100 vehicle pile up on the QE2 highway with as many injuries. One of the trucks was hauling a load of cattle that had to be moved from the scene of the accident. I can only imagine the chaos. It took 12 hours for the police to get the highway open to traffic again. The news reports presented such a dire image that our boss shut the shop down 2 hours early and sent us home. 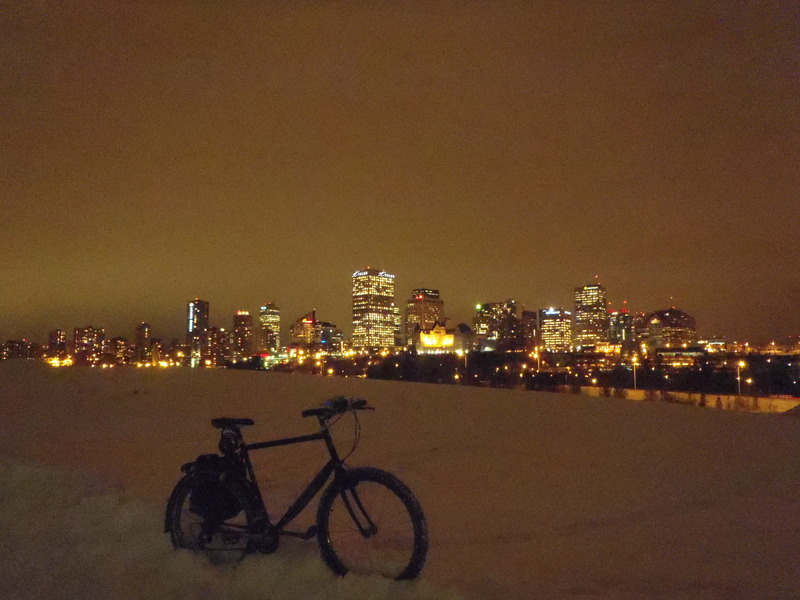 I am pleased to report that my ride home was tranquil and pleasant. My route was through lightly traveled residential roads and the MUPs. 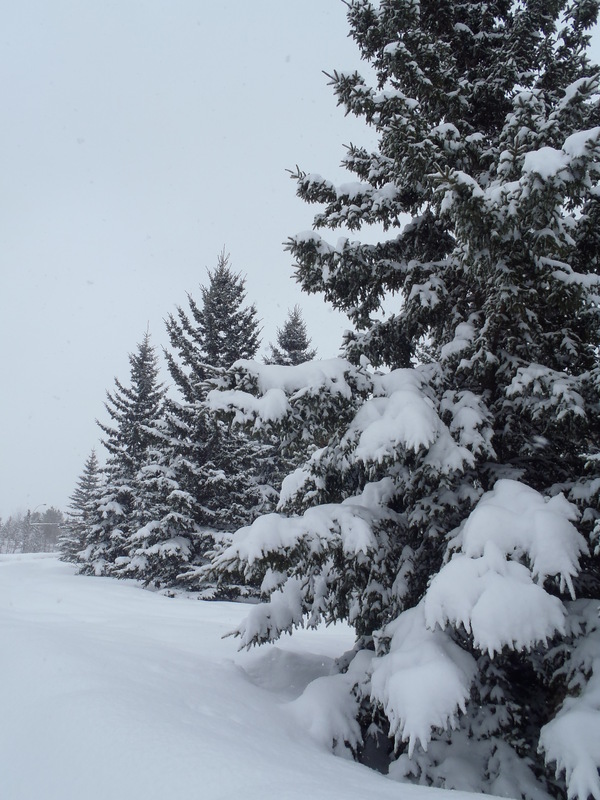 Close to a foot of gorgeous white powder had blanketed the city streets. 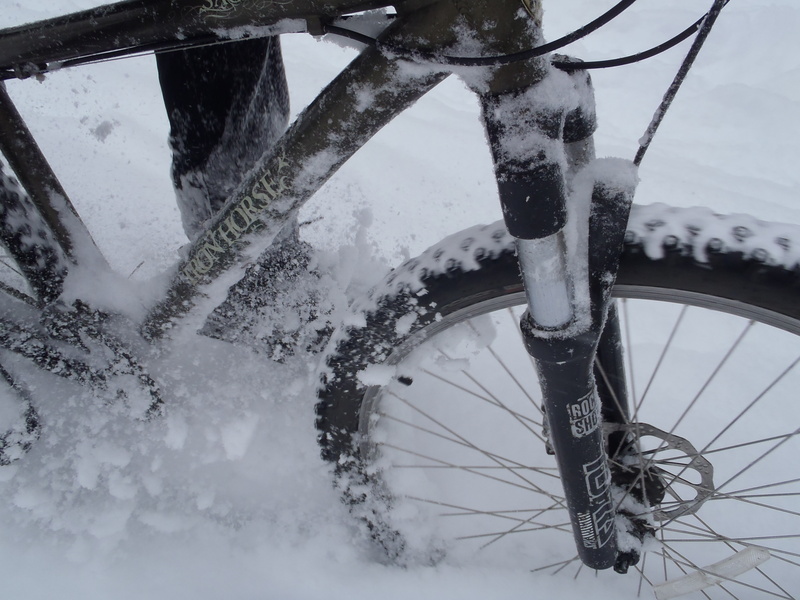 In these conditions you just stick to the low gears and churn steadily and slowly along. Sometimes, the back wheel acts more like a riverboat paddlewheel than anything else. On the rare occasion that a motor vehicle approached me from behind I pulled over to the side and let them pass. On days like this you can’t be sure that drivers have control over their vehicles. On most occasions the motorists gave me a friendly thank you wave for the courtesy. It’s nice when cyclists and drivers can get along like this. The ride through the ravine was beautiful. 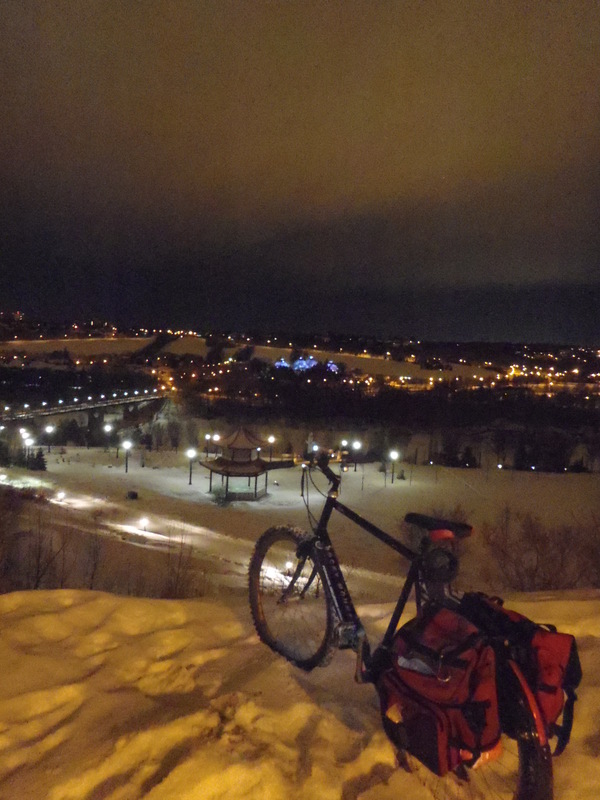 I was the only cyclist and I saw very few pedestrians. 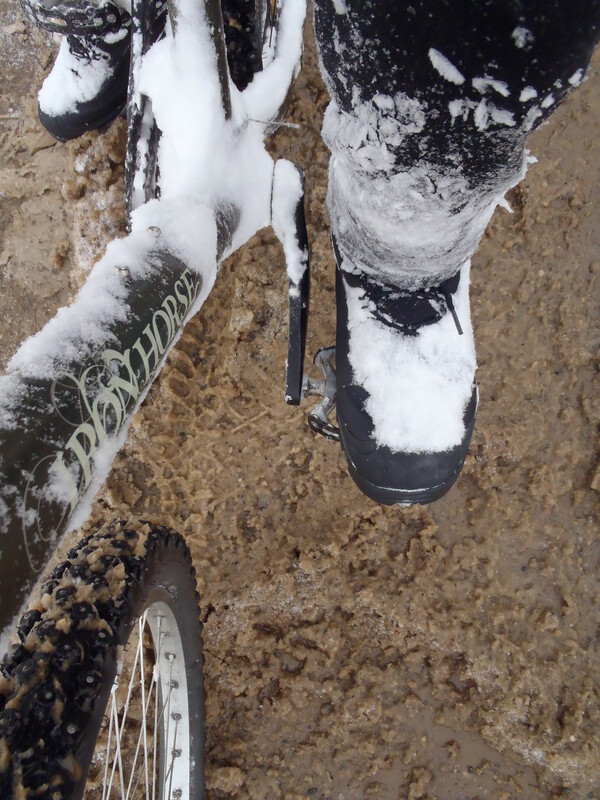 It was a real pleasure to break fresh tracks through the deep snow. I stopped frequently to snap photos and shoot a little bit of video. I only had to resort to pushing my bike at a few spots. All the while I was happy to not be in a vehicle creeping along the main roads through the glacially slow traffic. 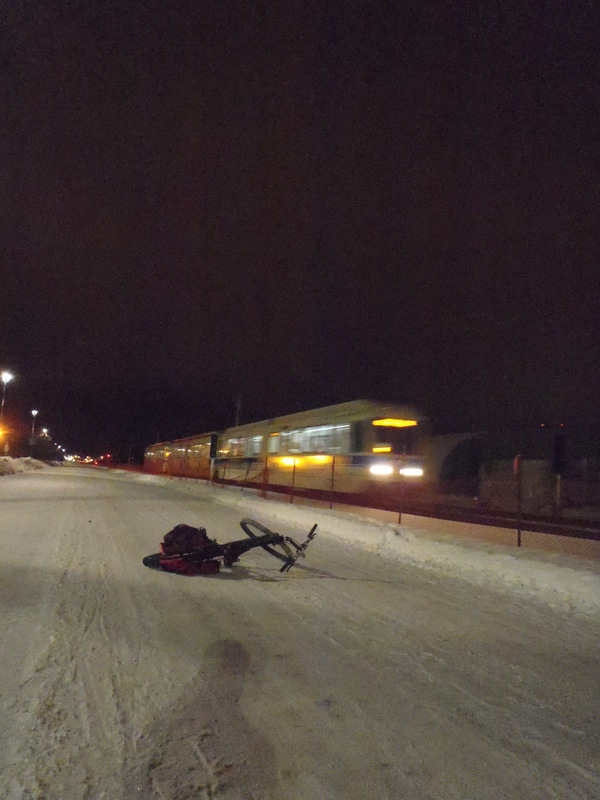 As I neared home I found that the trail by the LRT tracks had been plowed. This was a very happy way to end the ride. I arrived at my house wobbly legged and drenched in sweat but quite content. 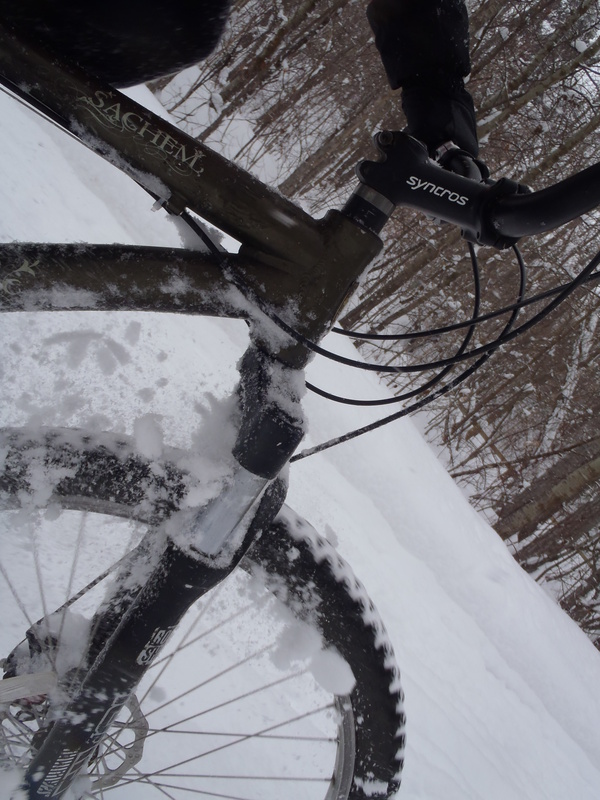 Riding through beautiful snowy Mill Creek Ravine. 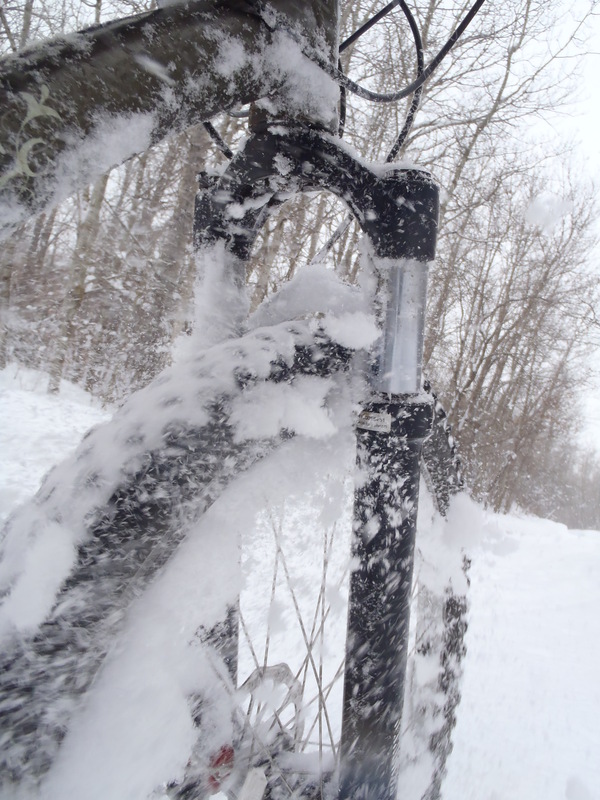 Taking this photo while plowing through the snow with one hand on the bars and one hand holding the camera was….not easy. Having taken the effort to snap these photos I’d hate to not use them on the blog. Be careful where you set your bike down. You might not find it again. I went for a short walk in the woods. 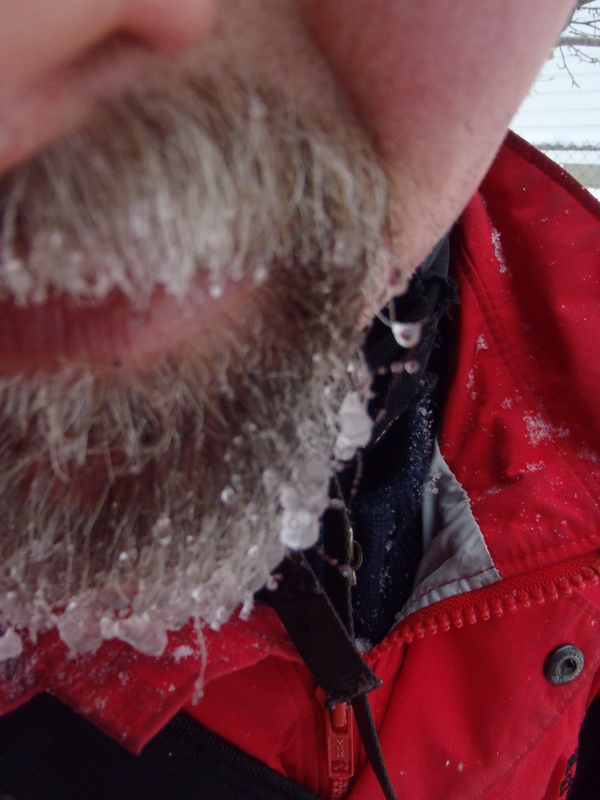 Home again with a smile on my face.The winter beard earning its keep. 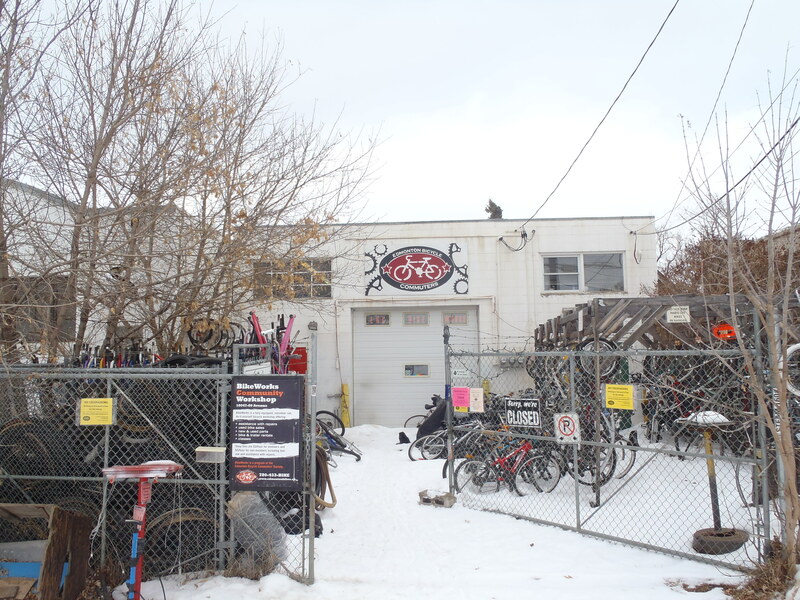 Continuing with the Errandonnee Challenge I mentioned in my last post, here are Errands #4 through #8. And a few bonus photos, just ’cause I’m feeling generous (or maybe mean). 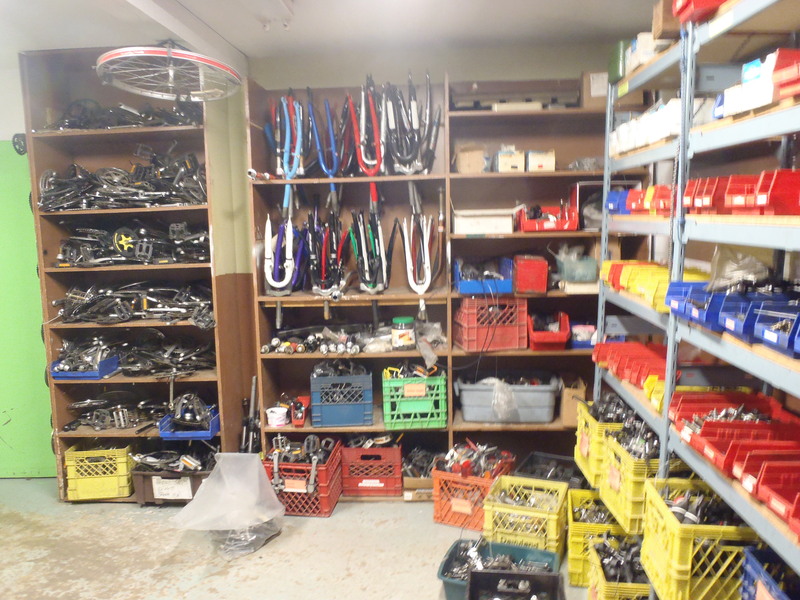 ERRAND #4: Sunday Afternoon, Volunteering at Bikeworks North. Normally BWN isn’t open on Sundays, but during the water problems at the south shop it was announced that BWN would be open instead. Even though the water was restored in time for the weekend we still opened the north shop. The shop is only a 5 minute pedal from my house so I popped over to put in a few hours. While there I spent a little while salvaging some hubs from a couple of damaged rims, starting tuning up another bike, and helped a fellow who was working on his first wheel build. 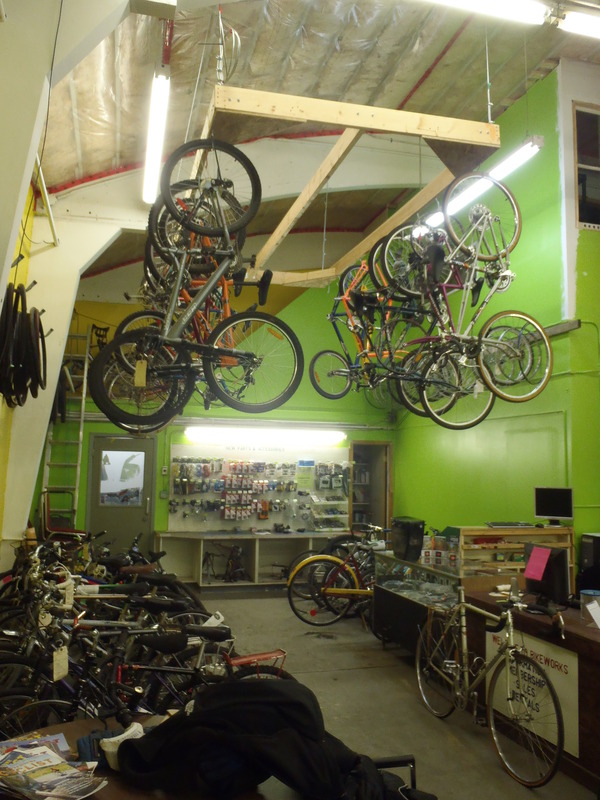 Bikes for sale. Come and check them out! Choose one that has already been tuned up by the volunteers or buy one as-is and fix it up yourself. 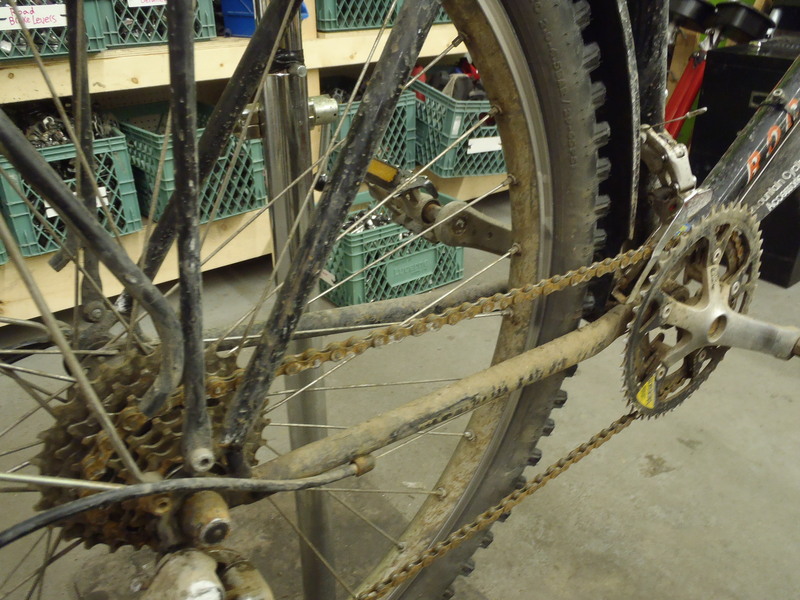 I started working on this old Kuwahara Savage MTB. 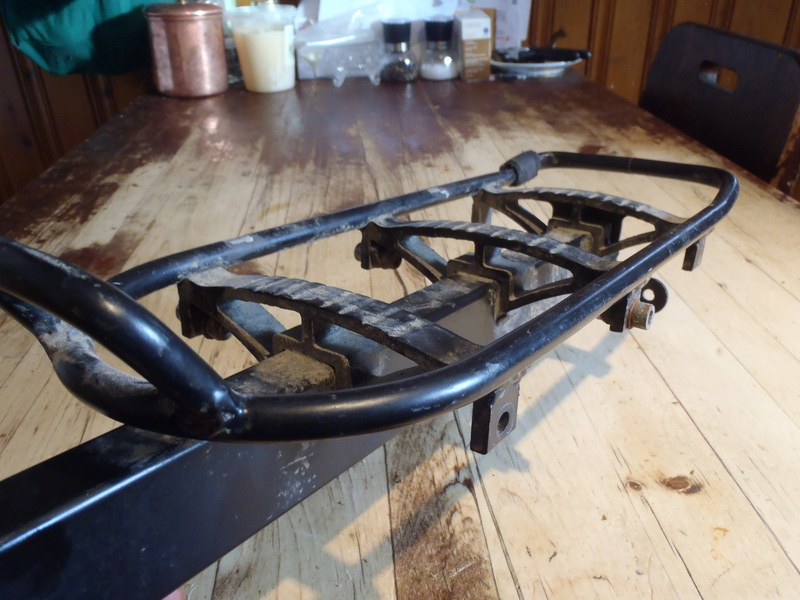 It’s a bit scuffed up but will make a great stealth commuter (a sweet riding cromoly frame c/w eyelets for racks and fenders that most thieves would’t look twice at). BWN seems to be Kuwahara/Apollo central right now. There are several more. I also cleaned and oiled my own bike. Our old printer died a little while ago and my wife has been in dire need of a replacement (me, I didn’t use it often). 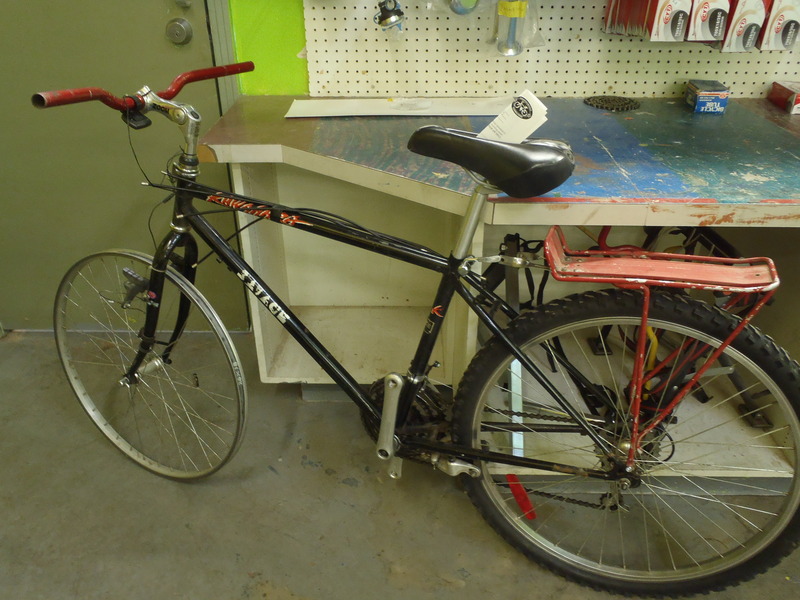 After finishing at Bikeworks I headed downtown to buy another printer. I’m picked one with a small foot print as space is at a premium in our small house. 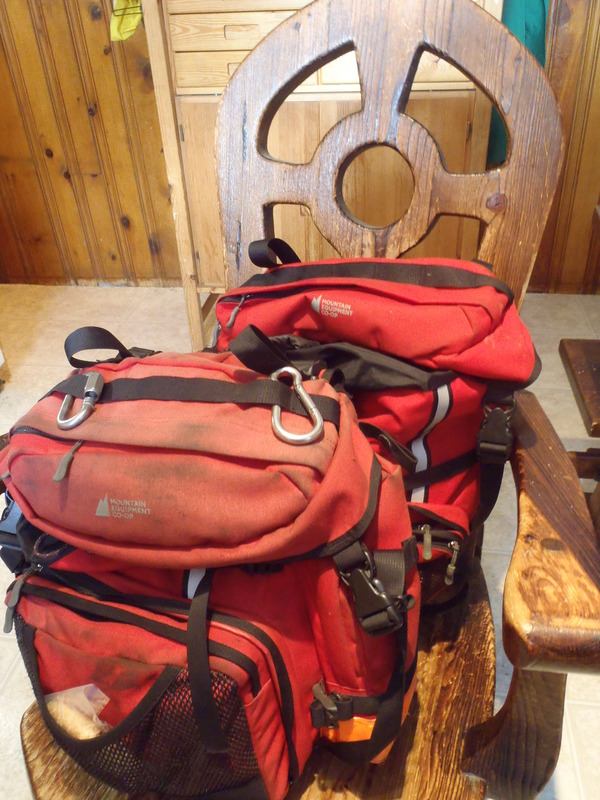 Even so, it was about as big a package as I was equipped to carry on my bike. 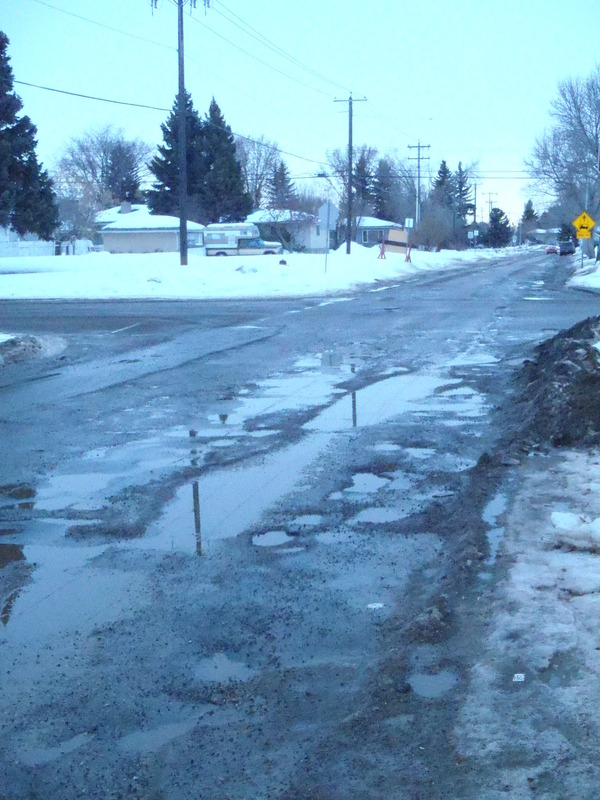 The main routes with bare pavement were no problem but the box slid around a bit on the heavily rutted side streets. Nonetheless, the printer arrived home intact and is now installed and working perfectly. 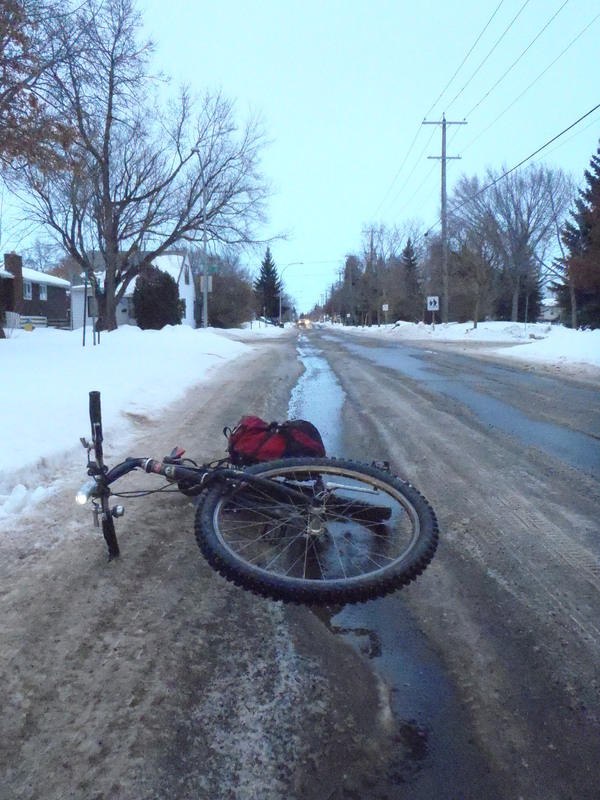 I used the omnipresent Canadian Kickstand to get this picture. ERRAND #6: Tuesday. Work. Again. Wheee. I was treated to another gorgeous sunrise on the way to work this morning but was running late, so I can offer no photo. After work I snapped a few pics of the road conditions near my workplace. These are on an official bike route. The unseasonably warm weather has continued and so real, honest to goodness asphalt is emerging from under the thick snow hard pack. 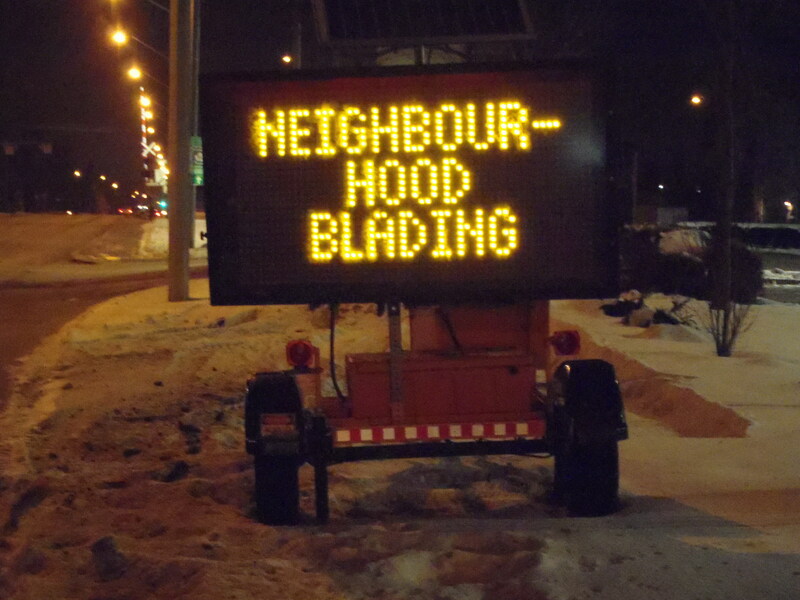 The city keeps the main roads cleared to the asphalt ( and does a pretty good job) but only blades residential roads to a 5 cm snowpack. They kept up on this through the first part of the winter but have been falling behind a bit and in many areas there is a good 6 inches or more of rutted, hard packed snow and ice. Gasp! The asphalt emerges! Dreams of riding speedy road bikes through summer days momentarily overwhelm me. So that’s what was under the snow! I discover that the winter months have not been kind to the road surface (none too good to begin with). This area is due for repaving this summer. EGS is conveniently located on my homeward route and I occasionally stop to pick up foodstuffs there. I was disappointed to find that they were out of Ohsawa Namu Shoyu soya sauce. Best…soya sauce…ever. On the other hand, that stuff ain’t cheap. 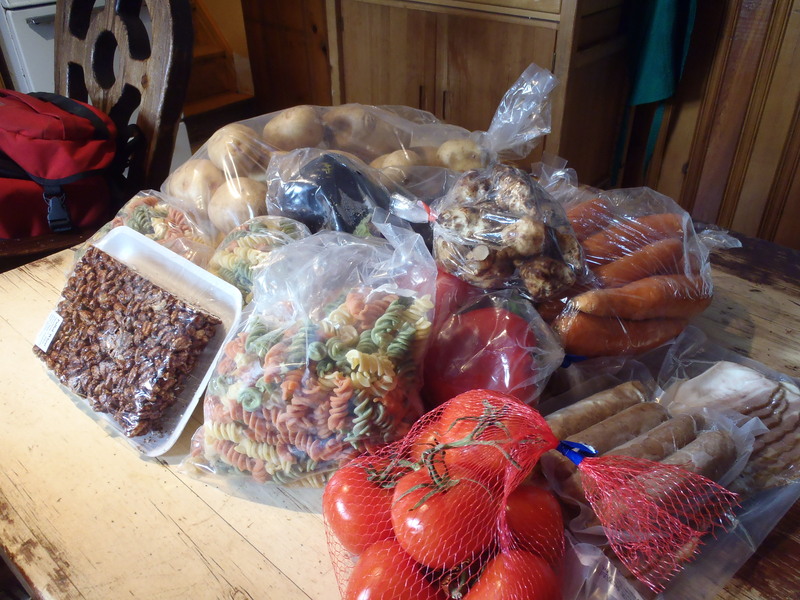 I did come away with numerous other items. Note the bike racks made from old bike frames. ERRAND # 8 Tuesday evening. 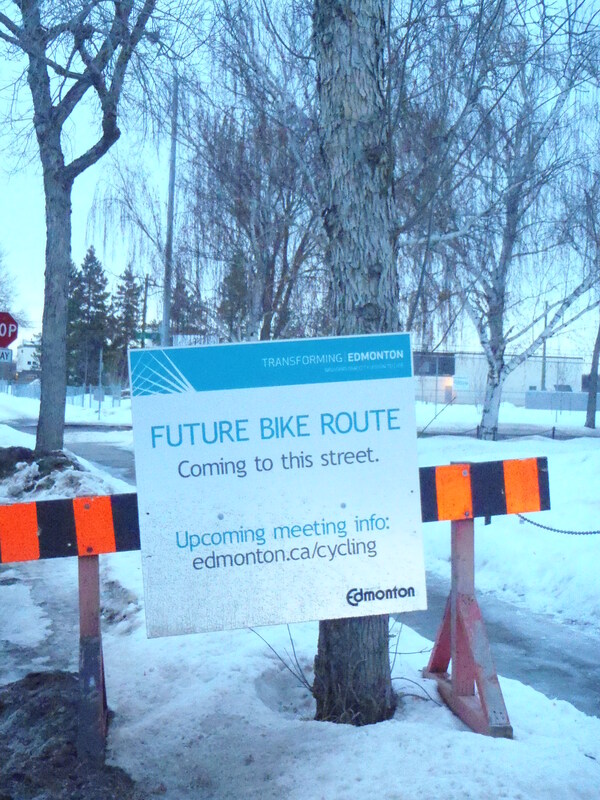 City of Edmonton community meeting on bike lane projects for 2013. This was one of two open house meetings that the city is holding to communicate the bike infrastructure plans for the 2013 construction season. This meeting was held in a school right next to one of the bike routes and was well attended with neighbourhood residents and cyclists: at least a hundred people, maybe more. Rolled out on long tables were maps of the proposed work, with post-it pads so people could make comments about specific issues. City engineers were present at the various tables to answer questions. 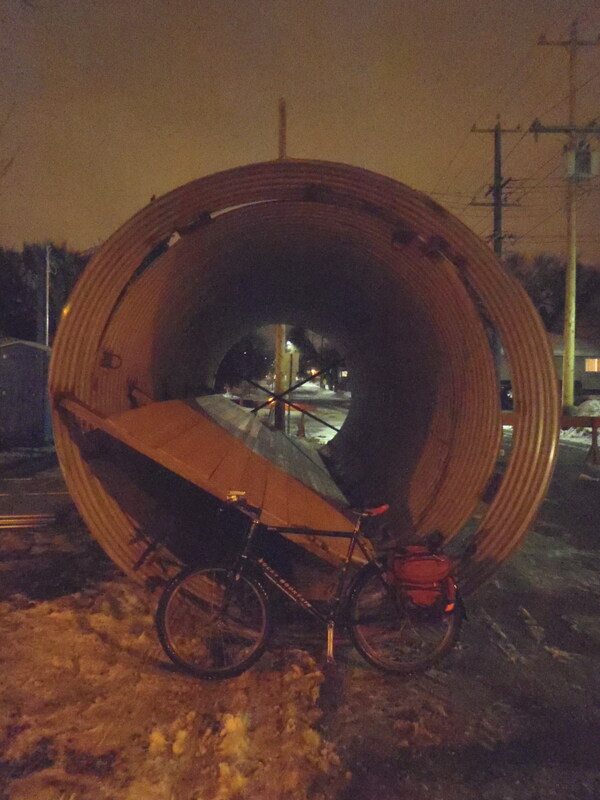 I watched the presentation, left a couple of comments, chatted with a couple of other bike commuting types I knew, and I headed for home. 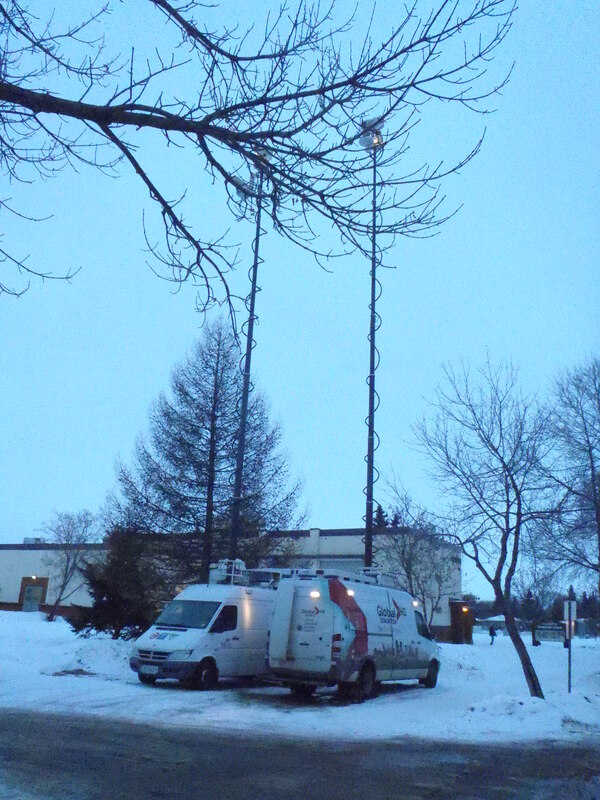 There was a lot of local news media in attendance. Not at all related to the errands, but it was a beautiful night so I stopped to take a few pictures on the way home. Edmonton: The City of Pyramids. 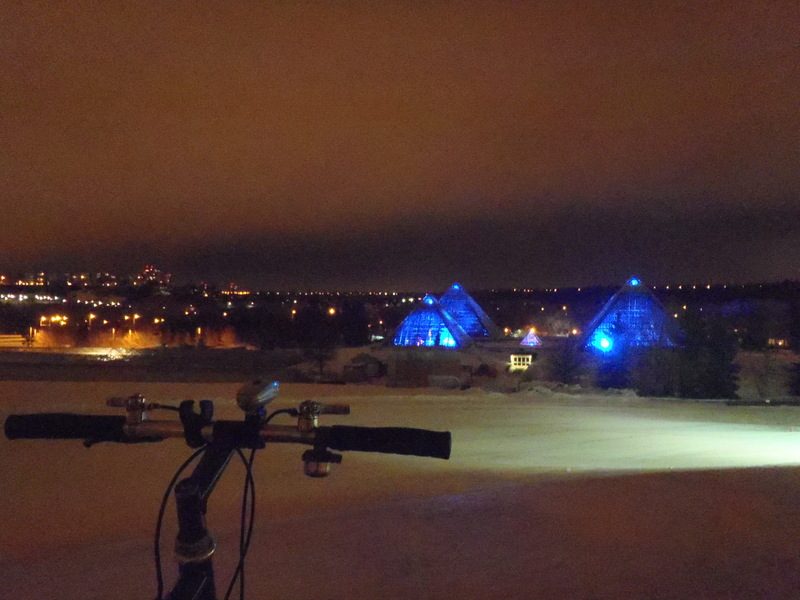 The pyramids are the Muttart plant conservatory, a green haven during the bleak winter months. At night they are well lit and change colour….a lot. 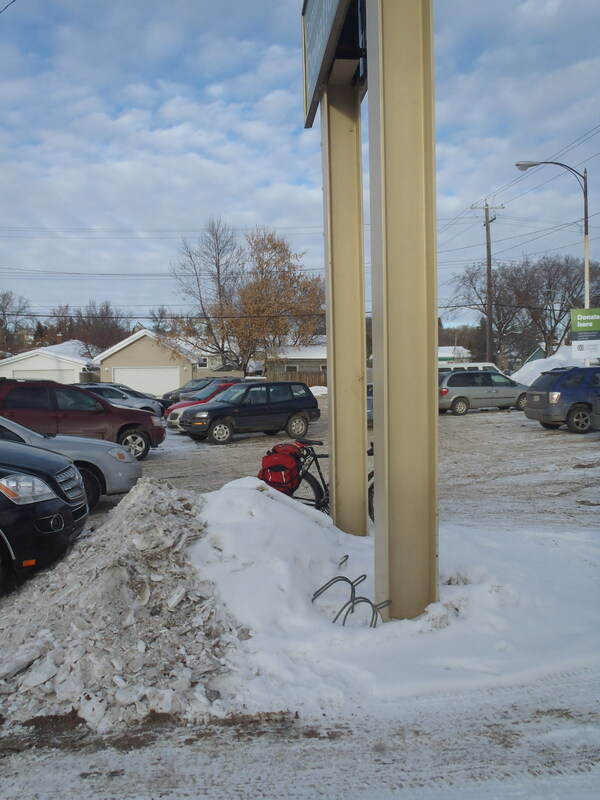 As a year round commuting cyclist, poor winter maintenance of bike parking locations is something I should probably be annoyed about. 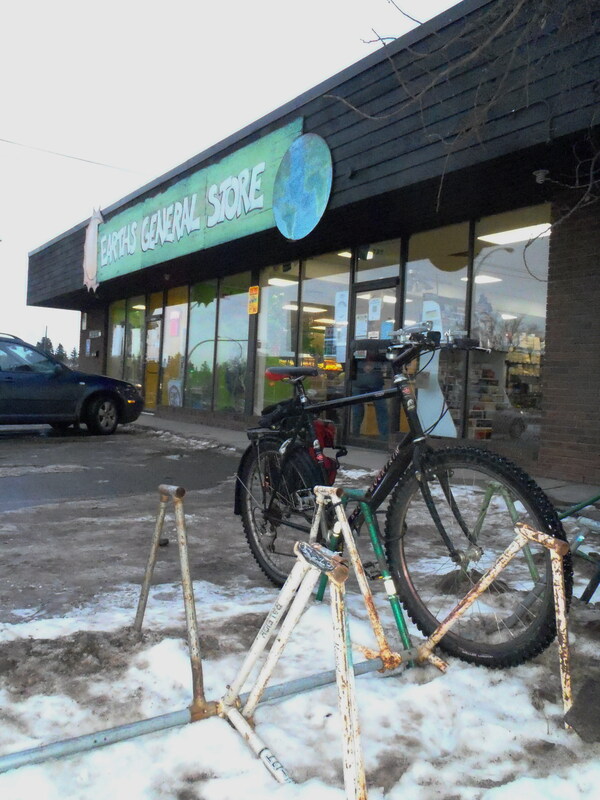 It’s true that a lot of businesses seem to regard the bike rack as the logical place to dump the snow they shovel from walkways. 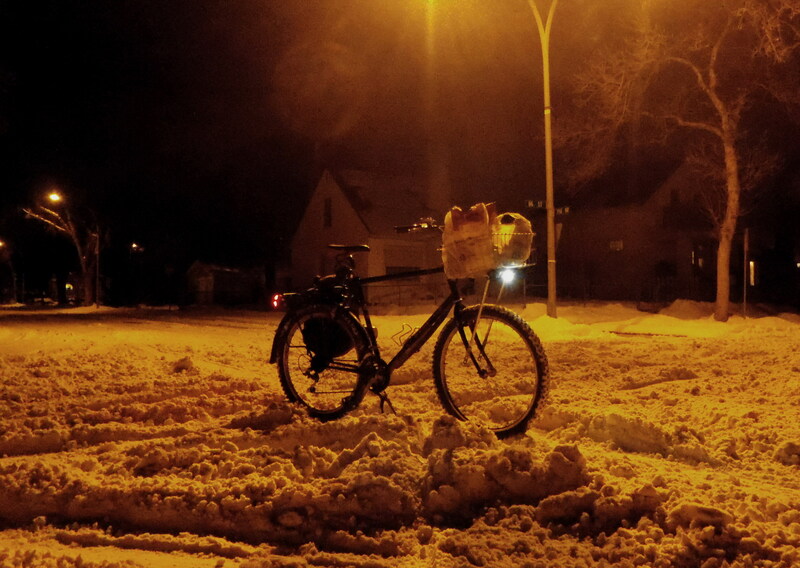 After all, nobody cycles in winter. If they do, they’re probably crazy enough that you don’t want them wandering into your retail establishment. In practice, it doesn’t usually bother me. 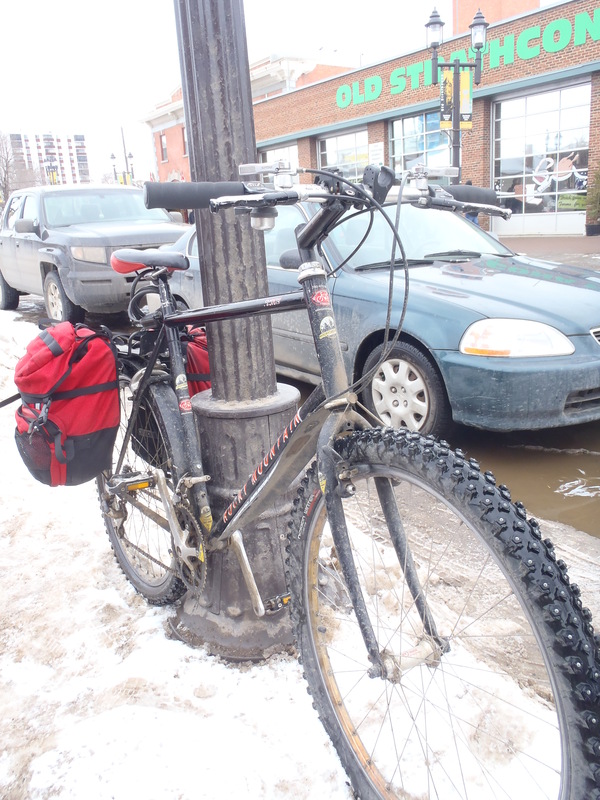 There actually are less cyclists competing for rack space in the winter so I can usually manage to find a spot. There should be no expectation of finding statistical significance in the contents of this blog post. My sample size is a whopping four parking locations that correspond to the times that I actually had my camera with me and I remembered to take a photo. Save-On Foods (112 Ave and 82 St.) This is a hilariously perfect example. 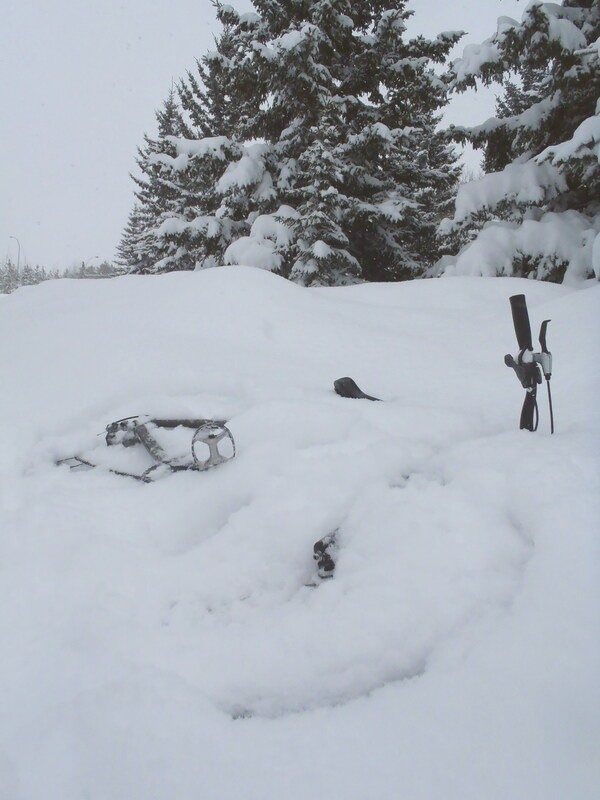 A completely snow free walkway and a buried rack. It actually hasn’t been a problem, as there is enough room for two bikes at the rack, and I’ve never seen even one other. 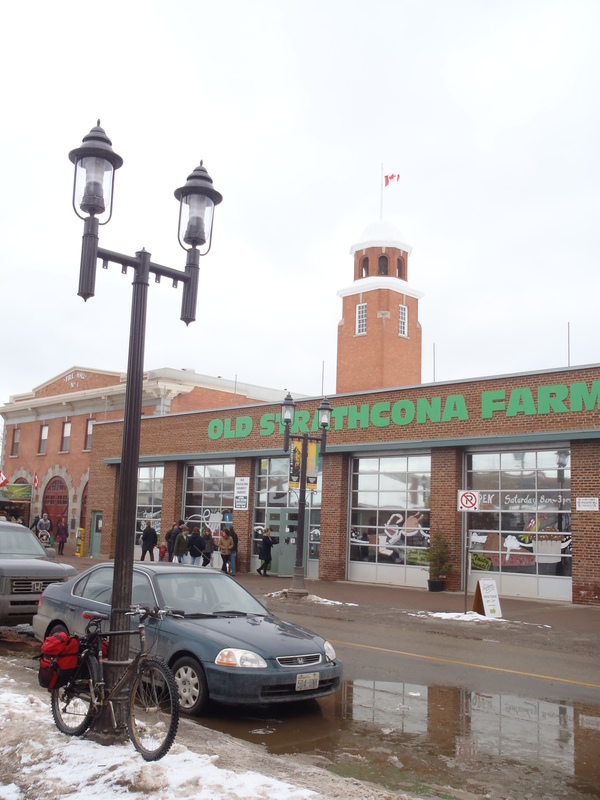 Strathcona Farmer’s Market. This one is a bit disappointing. I expect better of Farmer’s Market. 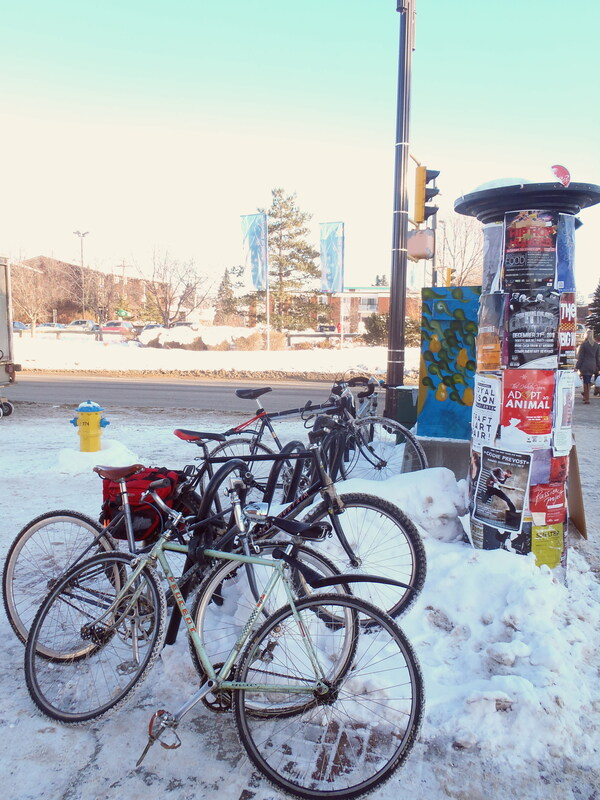 Even in the winter there are usually a number of bikes parked outside (such as the nifty Peugeot and Kuwahara seen here in the front). 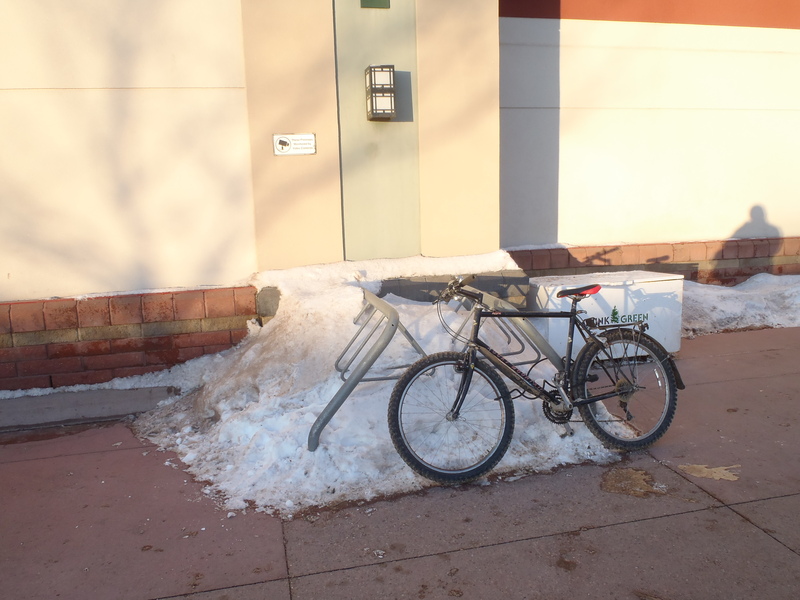 They should do a better job of keeping this rack free of snow. Value Village (Whyte Ave location). This one is pretty bad. The rack is one of the low ones and it’s been covered almost completely. 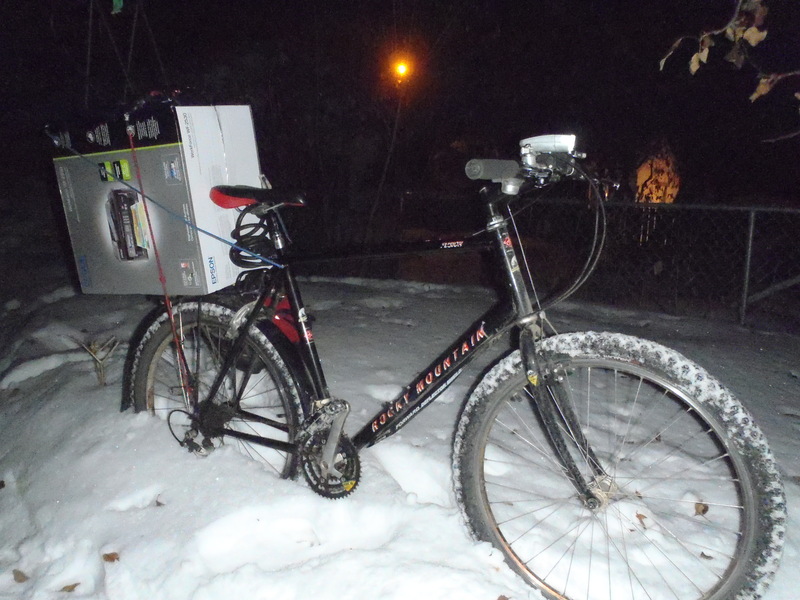 I locked my bike to the pole. On the other hand, at least they have a rack, unlike the northside location. Safeway (118th Ave & 82 St.) My local grocery store is the surprise winner in my small survey. 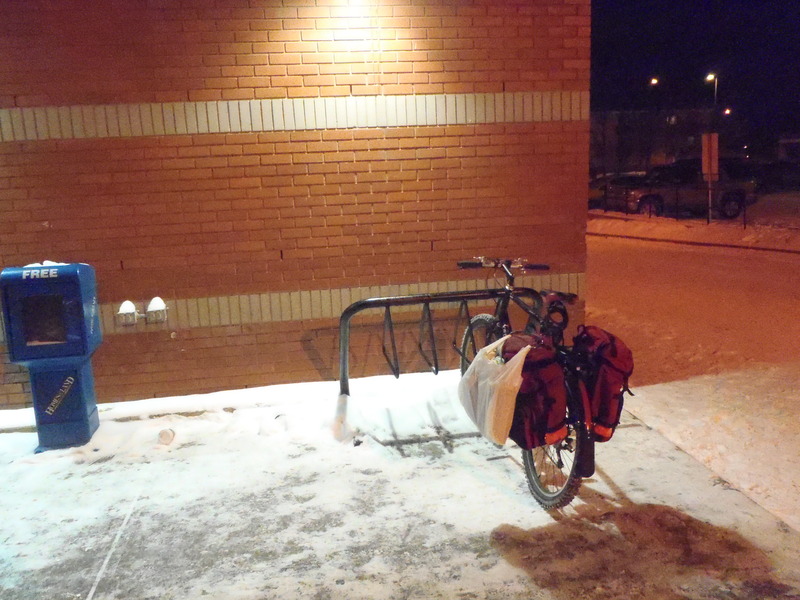 The bike rack is always free of snow and has the bonus of being well lit and close to the doors. Congrats Safeway! You get the Tuckamoredew Bike Parking Seal of Approval.